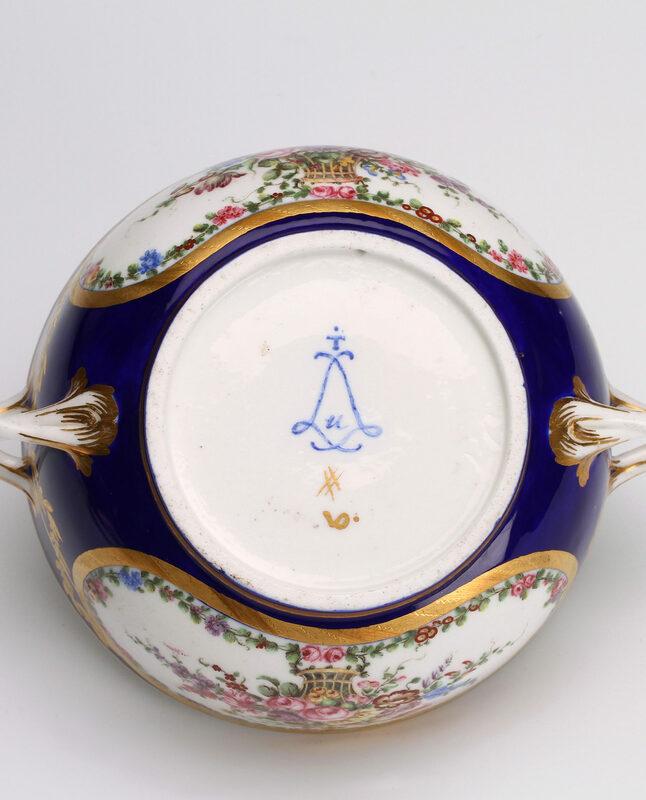 From about 1745, the porcelain manufactory at Vincennes (established in 1740 on the grounds of a former hunting lodge, east of Paris) marked its wares with the royal cipher – two interlaced L’s. This is usually painted in cobalt blue, either in overglaze enamel or in underglaze pigment. A date-lettering system was introduced around 1754. Soon the factory’s decorators, particularly painters, began to mark their work. Throwers, moulders and répareurs, who fashioned or assembled objects, incised marks into the clay, which although largely unidentified, provide some evidence of authenticity. For a detailed discussion of marks see Rosalind Savill, The Wallace Collection Catalogue of Sèvres Porcelain (London, 1988), vol. III, pp. 1081-1137. The base of this Vincennes soft-paste porcelain ewer is painted under the glaze before firing with two interlaced ‘L’s taken from the French royal cipher. Enclosed within the cipher is an A, the date-letter for 1754. These appear in upper or lower case. The four dots have yet to be explained and are perhaps a painter’s mark. When the factory moved in 1756 from Vincennes to Sèvres, near the court at Versailles, the same marking system was used. Here, the letter ‘H’ is enclosed within the ‘L’s in blue enamel, indicating that it was made in 1761. Around 1990, the unidentified painter’s mark, a crescent, was attributed by Bernard Dragesco, a French Porcelain Society member, to Louis-Denis Armand, l’aîné (the elder), the factory’s finest bird painter, active between 1745 and 1783. A list of the factory’s decorators’ marks can be found in David Peters, Sèvres Plates and Services of the 18th century, (2005; new ed. 2015), vol. 1. 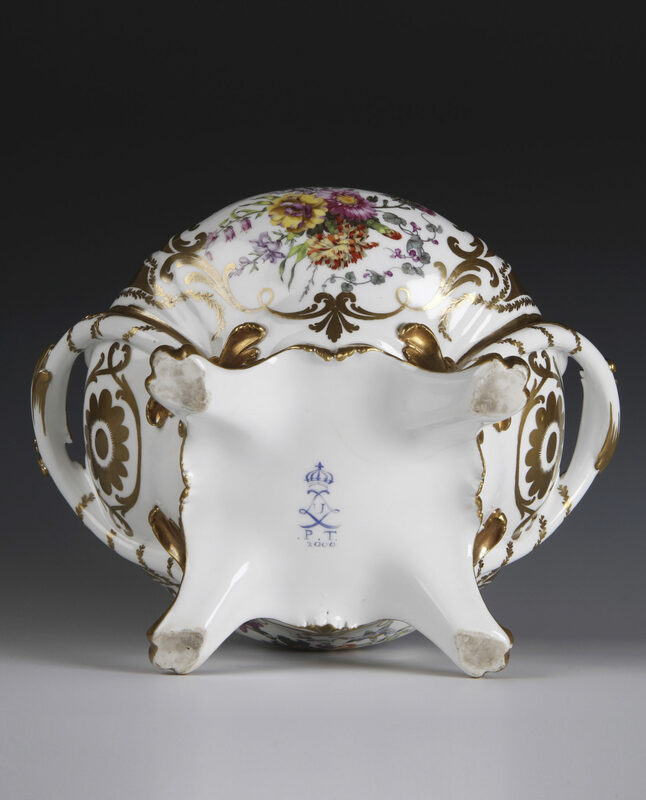 The Sèvres factory introduced a hard-paste porcelain body in the 1770s, following the discovery of a French source for kaolin in 1765-8, at Saint-Yrieix, near Limoges. The new material affected the enamelling process, so wares in the new body were marked with a crown over the interlaced ‘L’s. 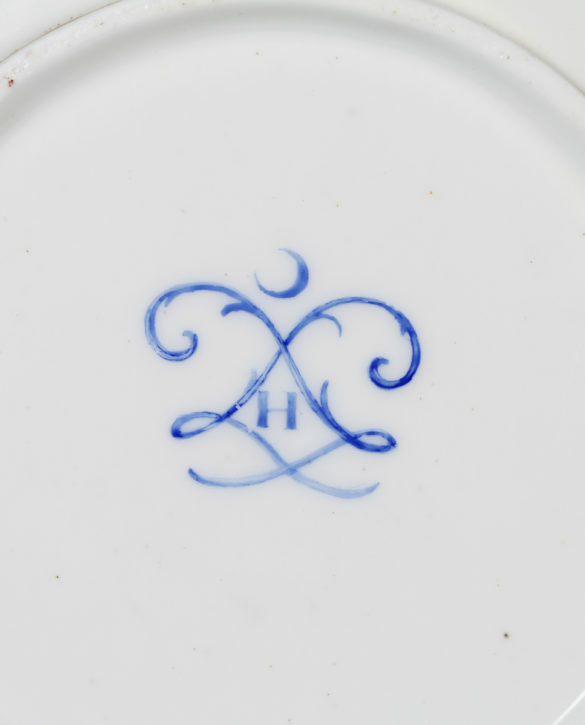 This mark is in blue enamel (other colours were also used) and has the date letter ‘U’ for 1773, above ‘.P.T.’ for the painter Pierre-Nicolas Pithou l’aîné (active 1759–90) and ‘2000’, the mark applied by the gilder Henry- François Vincent (active 1753–1806). 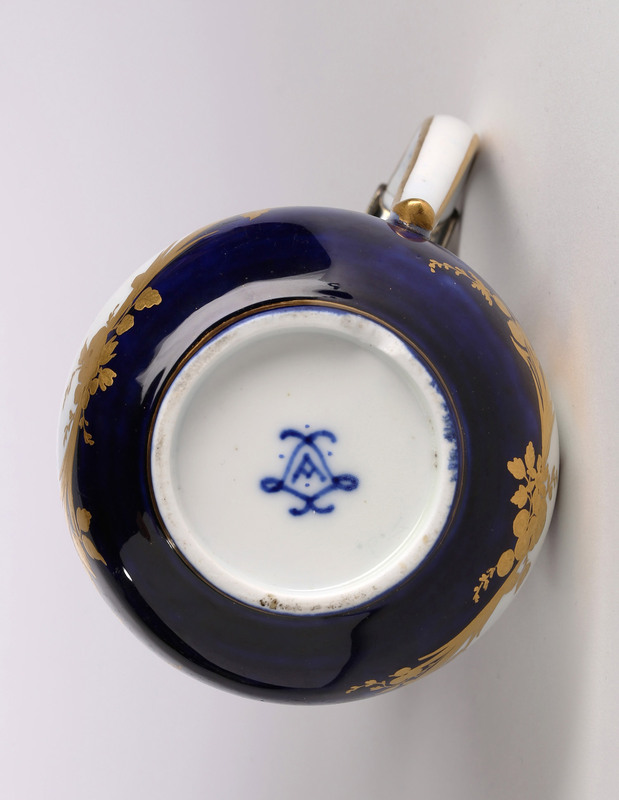 The Sèvres manufactory continued to produce soft-paste porcelain, marked by the interlaced ‘L’s, typically in blue enamel. Here, the ‘u’ enclosed within is the date letter for 1773, above is the dotted ‘T’ mark used by the flower painter François Binet (1730–75), above a gold hashtag device used by the gilder Michel-Barnabé Chauvaux, l’aîné (active 1752–88) and the gold ‘VD’ dot cipher used by the gilder Jean-Baptiste-Emmanuel Vandé, père (active 1753–79). There is also the incised mark, ‘jd’, added by the formers before the first firing of the broth bowl. 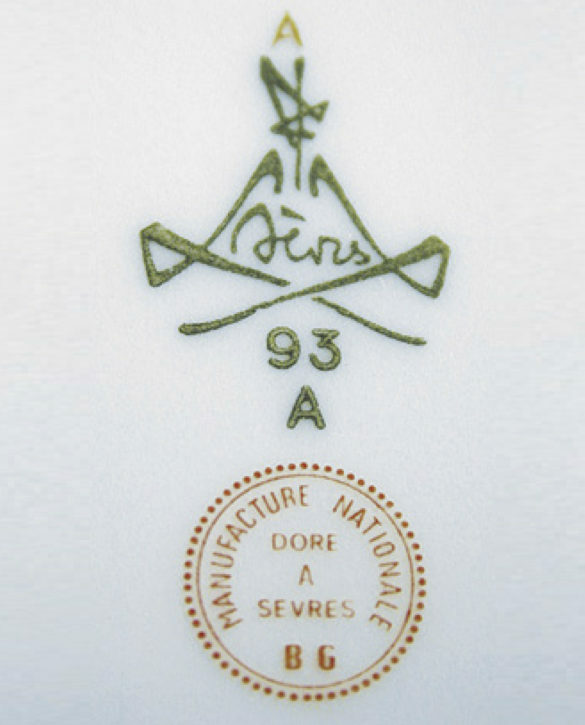 Throughout the nineteenth century, the Sèvres factory introduced a number of transfer-printed marks incorporating date years. The underglaze green lozengeshaped mark indicated the year an object was glazed and fired, here, 1862. 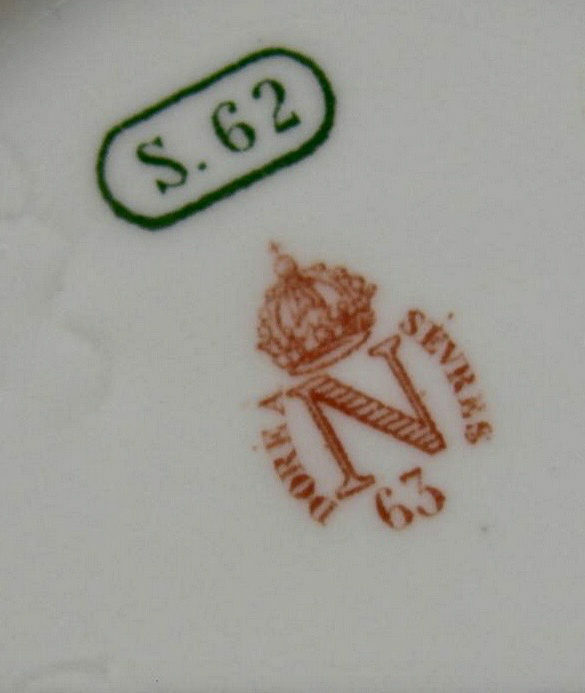 A red-printed overglaze mark of a crowned ‘N’ for Napoleon above ‘63’, for 1863, and incorporating ‘DORE A SEVRES’, was added when the gold-printed decoration was applied, evidently the following year. The most recent factory mark was designed in 1970 by the French abstract painter and art theorist Georges Mathieu (1921-2012). It is printed in the traditional green or ‘vert de chrome’. The red enamel printed mark incorporates the initials of the artist credited with the design and there are typically various incised marks indicating the designer, paste, and painter. of this paper is available under Publications. Faÿ-Hallé, Les vases de Sèvres XVIII° – XXI° siècles, éloge de la virtuosité (Paris, 2014), pp. 290-91.